Project Units recognized to show the elevations in the correct units. Added option to select Decimal precision. Added option to write the elevation on a SavedViewPoint when clicking a point. Improved TEXT drawing. Now all the FONT STYLE are drawn correctly and accurately. Added a crosshair to identify point of reference. Spot Elevations now store user preferences: Color, Size, Decimals, Font, Offset, Write Elevation on Click. 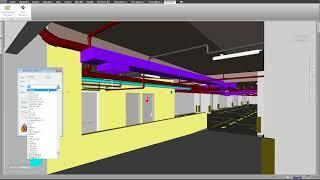 El Spot Elevations de Revit apliacdo a Navisworks. Necesario sin duda, si necesitas obtener los niveles en navis sin necesidad de ver cada plano. Thanks a lot, It definitely helped me a lot. me fue super util, me ahorra mucho tiempo para terminar mi proyecto, el tiempo es dinero. Muchas gracias. me facilita mucho el poder identificar alturas de distintos elementos al mismo tiempo. Encuentro los mejores App aqui :) muy buen aporte. gracias a esta app pude identificar mis elevaciones de revit en Navisworks® de una forma eficas y sencilla. Very easy to use and saves me loads of time verifying the clearance of many objects. Looking forward to some great tech from PROISAC-BIM-VDC.